We will discuss how to manage rough footage, and streamline processes through the traditional steps of video post-production. We will also look into some recommendations for hardware and software equipment. We will learn how and when to hire an editor who understands and complements the director’s vision. We will also explore how to effectively communicate during the editing phase. This session will be a presentation of a general overview of editing. Topics include the basics of importing, organizing, color correcting, grading, rendering and outputting shots. Learning how to enhance a story through color effects, and the magic of color to manipulate the viewer. To learn the paramount importance of sound in any video production and why you should consider editing trailers and teasers. 10. Assignment: With or Without Sound/Can you Feel the Music? Understanding of which tools, apps, techniques, and additional resources would work best for photographers and filmmakers working with small crews and tight budgets, without compromising the quality of the project. Understanding of how and when to hire an editor, who understands and complements the director’s vision and how to effectively communicate during the editing phase. Understanding of how to manage rough footage, and streamline processes. Understanding of the basics of importing, organizing, color correcting, grading, rendering and outputting shots are covered. Understanding of how to enhance a story through sound effects, and the magic of color to manipulate the viewer. Understanding of the paramount importance of sound in any video production and why you should consider editing trailers and teasers. Eduardo Angel is an Emmy Award-winning filmmaker, independent technology consultant and educator. Holding an MFA in Photography from the Savannah College of Art and Design and a Bachelor of Architecture from Los Andes University, he has taught at The School of Visual Arts, the International Center of Photography, the Fashion Institute of Technology, and has mentored the Photography program at The Savannah College of Art and Design. He is the author of popular filmmaking courses on Lynda.com and his book “Filmmaking Essentials for Photographers” ranks among Amazon’s top choices for photographers and filmmakers. Eduardo has worked as an Adobe official Beta Tester for Lightroom and Premiere Pro. 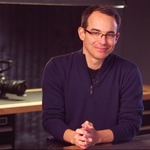 He is a cofounder of the production company The Digital Distillery, speaks at conferences around the world and has published his thoughts on technology, photography, and filmmaking at Canon’s Digital Learning Center, Adorama’s Blog, and eduardoangel.com. Selected clients: Adobe, Adorama Pro, Avon, Benro, B&H Photo, Brooklyn Museum of Art, Canon, Chicago Architecture Foundation, Cinevate, Doyle, Fashion Institute of Technology, Future Media Concepts, Gulf Photo Plus, Hasselblad, HOW Design Conference, Japan Society, Lynda.com, McCann Erickson, New York Magazine, NAB, New York Times, Panasonic USA, Panasonic Middle East, Photo District News, PhotoPlus Expo, Photokina, School of Visual Arts, Sigma, Sony, Tether Tools, Tenba, Time Inc., Verse and X-Rite, among others. Choose any camera brand you feel comfortable with. Other pieces of equipment that are important are an audio recorder, a pair of over the ear headphones, windscreens and a mixer. There is no specific requirement for video editing software. You can use what works best for your budget or comfort level. Avid and Adobe Premiere Pro are the industry standards but there are a variety of alternatives that can help you achieve your goal. This course features different useful Post Production applications. You can test these applications using either an Apple or Android device. If a student signs up for the Photographer to Video in Today's Gig Economy program, it is recommended that these courses are taken sequentially. This course is also part of the Program: Photographer to Video in Today’s Gig Economy, and you'll earn a verified Specialist Certificate after successfully completing the Program. This course is part of the program: Photographer to Video in Today’s Gig Economy. Programs unlock exclusive content (courses) that helps you develop a deep understanding of your subject.